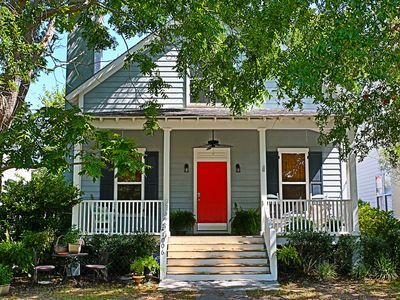 Bright and cheerful cottage! FALL & WINTER DISCOUNTS OF UP TO 55%! 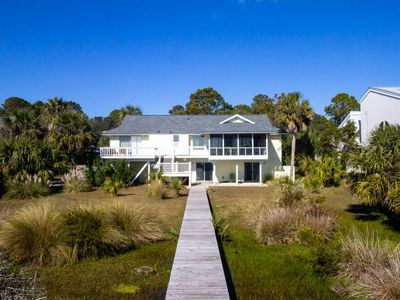 The "Loveshack" is centrally located on the island, tucked in a lovely enclave amid the Ocean Creek golf course. 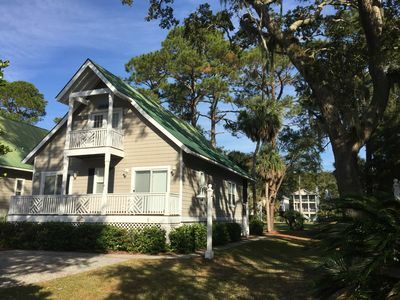 It is just a short walk or golf cart ride to the marina, the Ocean Creek Golf clubhouse, the Cabana Club and one of the most popular stretches of beach. 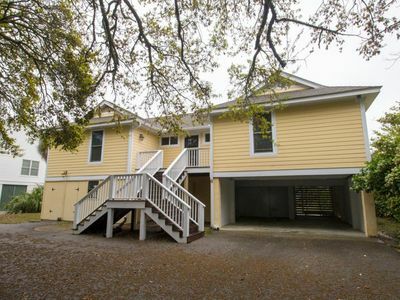 The upstairs Master bedroom features a queen bed, vaulted ceiling with skylights and ceiling fan, television, drawer storage, large closet, French doors opening to a private balcony, and a private bath with jetted tub and shower. 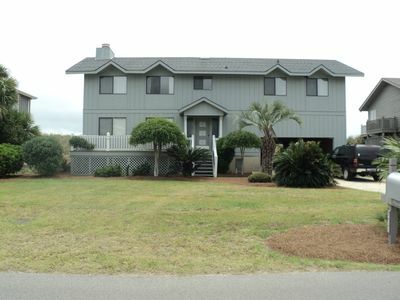 There are two bedrooms on the first floor, each with a private bath and television. The downstairs guest bedroom has two queen beds, drawer storage, closet, access to the lower balcony and a full bath with shower. 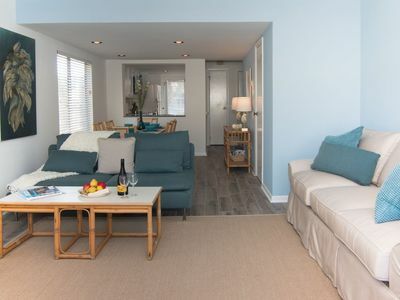 The Downstairs Master bedroom has a queen bed, bath with tub and shower, drawer storage, closet, television, access to downstairs balcony, and attached laundry room. 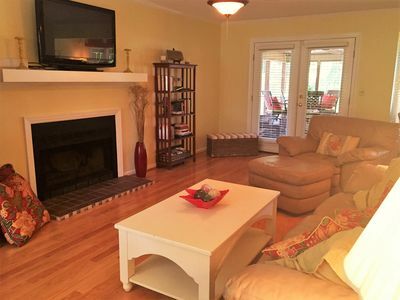 Large living/dining area, screened -in porch, cute back patio for relaxing! 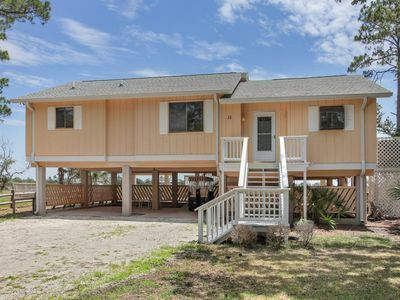 There is an outdoor shower for rinsing beach sand and salt residue off of bodies and bathing suits before entering the cottage. A fully equipped kitchen makes preparing full meals for the family a breeze. 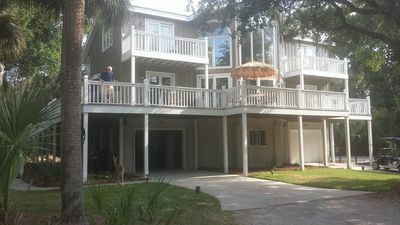 There is a lovely screened in porch, with a swing and two rocking chairs, for relaxing in the evening with a cocktail or a book (or both) without worrying about pesky insects spoiling the outdoor enjoyment. Along with linens, towels and all kitchen accessories, we provide a starter supply of bar soaps, dishwashing detergents (both for hand and machine washing), clothes washing detergent and paper supplies. We have an automatic drip coffeemaker and a Weber Grill at the cottage. We have a toaster, but no waffle iron. One would need to buy some charcoal for the grill. We use match light, and it works well. We have several beach chairs and a beach umbrella, available for your use. 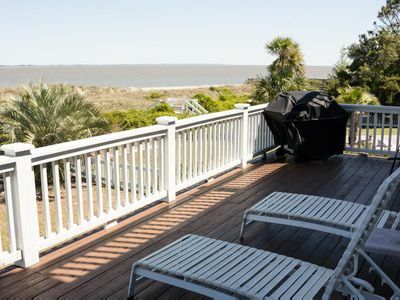 There are beach chairs and umbrellas for rent on the beach behind the Fripp Island Club resort as well, if you are enjoying the beach at that location. Please do not take bath towels out of the cottage. We have a small supply of beach towels, which you are welcome to use if you do not have enough. We ask that you please not take them with you when you leave! 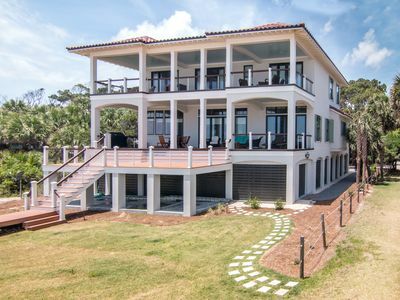 Fripp Island Resort has an Amenity Guest Passes policy. 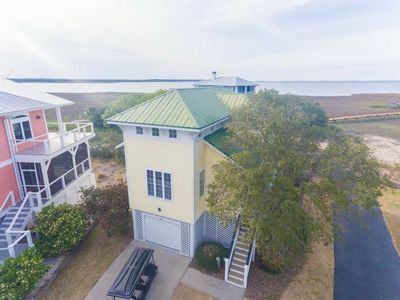 One can certainly enjoy the beach, the wildlife, hiking, biking, day trips to nearby Hunting Island state park, the quaint shops and restaurants of Frogmore, and Historic Beaufort without amenities cards. Also, our full kitchen makes cooking complete meals for the family in the cottage easy and convenient. So, amenities cards are not an absolute necessity. However, in order to use the resort restaurants, rent equipment, play golf or tennis or use the resort pools, anyone thirteen years of age or older, must have an amenities card. Anyone under thirteen must be accompanied by an adult with an amenities card. 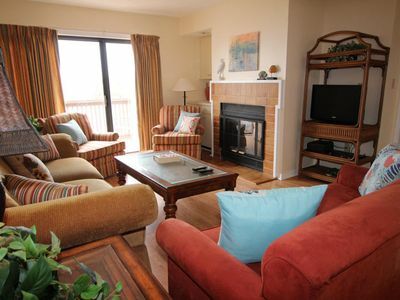 We do provide two free amenities cards with the weekly (seven night) rental of our condo. Additional cards can be purchased, through us, if desired. The cost for a weekly card (5-8 days) is $50.00 each during the summer (May 25 - September 1, 2018) and $35.00 for a Four Day Card (1-4 days). During the rest of the year, the cost for Weekly cards is $35.00 and the cost for Four Day Cards is $25.00. The cards must be purchased through a member of the Club. There are seven resort pools on the island. Sometimes folks don't take advantage of all of them, so don't forget (if you have amenities cards) that you do have options for swimming, other than the great Atlantic Ocean. A favorite pastime, for adults and kids alike, is crabbing. There are several spots on the island where this can be done. One just needs a bucket, a net, some strong twine and some bait! Of course, there are miles of bike/walking paths throughout the island, as well as a couple of playgrounds. There is a large chalk board posted in front of the Fripp Island Club, on which they post activities for kids, families, etc., on a weekly basis. There are boat excursions, deep sea fishing tours, etc. available through the marina. Of course, there are two superb golf courses and plenty of tennis courts available for sports lovers. Also, we have a notebook on the coffee table of the cottage, in which I have put lots of information about activities available on the island. The Cabana Club (just a short distance from the cottage) has three pools, including a fun “kiddie pool”. There is also an adult beverage bar and a grille, which serves various lunch items. This is a very popular spot on the island. 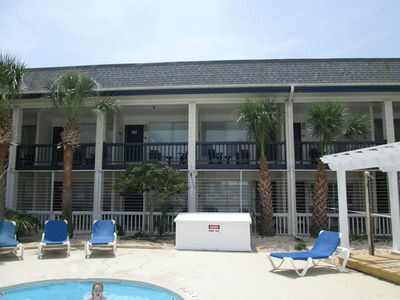 Also a short golf cart ride away, is the Beach Club. There is an adult only pool there, the "SandBar" for adult beverages, an Olympic pool, which is surrounded by a couple of shops, the Fitness Center, a childrens' pool, a "sit down" restaurant for dinner, the Beach Club Food Court (which offers all kinds of kid/family friendly food) as well as soft serve ice cream, Starbucks coffee, sandwiches, smoothies, etc. 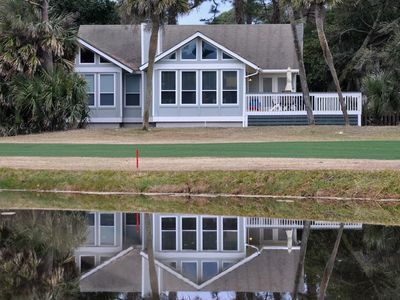 The Raquet Club is right across from the Beach Club, and the golf courses are very close by. 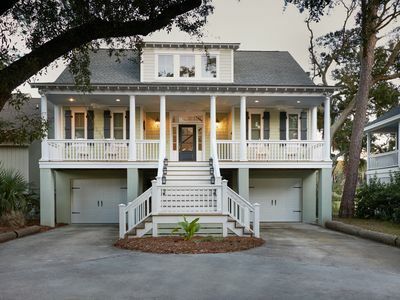 You will want to stop at Publix on Lady's Island (about eighteen miles outside of Fripp) to purchase any perishable items you might want to have at the cottage such as bread, milk, cereal, sandwich fixin's, chips, pickles, nuts, condiments, soft drinks, fruit etc.. The other option for shopping would be a brand new Walmart, which is just a mile or so past Publix, on the left. There are a couple of "mini-marts" on the island, but they tend to be quite pricey. We like to take our own breakfast, lunch and snack foods to save money. However, there is a food court and also a nice restaurant for dinner at the Beach Club (right next door to the John Fripp Villas), and there are several other places where one can eat out on the island (with amenities cards). As for provisions once one is on the island, The SpringTide Market is a full line grocery store offering the locals and Fripp Island visitors a great selection of groceries and goodies, though the prices are a bit higher than on the "mainland". They offer fresh gourmet coffee and teas, fountain drinks, ice, fresh produce, sandwiches, ice cream, beach items and accessories. They offer domestic and imported beer, wine, and spirits. Beer and wine sales are also available on Sundays! Springtide Market is located beside the Island Real Estate Offices just after passing through the front gate to the island. The SpringTide Market is open 7 days a week and club amenities cards are not required. 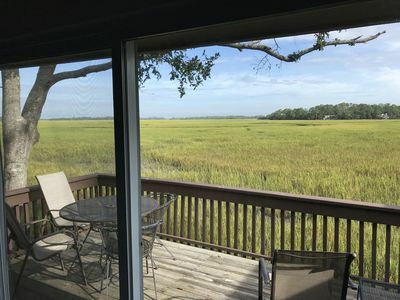 There are several places, such as the Shrimp Shack, and Johnson's Creek Tavern (one of our family’s favorites) just off the island where one can dine. Lady’s Island has some unique and eclectic restaurants, and there are quite a few casual dining restaurants (such as Outback Steak House) in Beaufort. There are also several "fine dining" establishments in Beaufort, and it's really not a bad drive for an evening out. 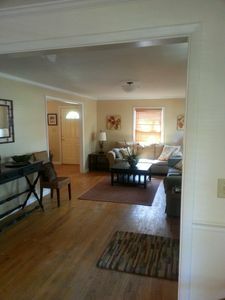 Rental of the cottage is contingent upon direct communication between the guest and the homeowner. 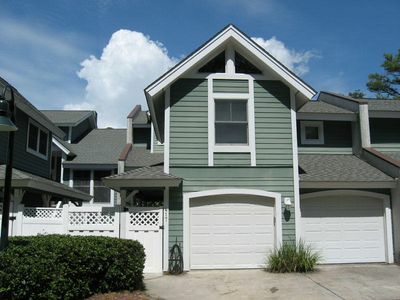 No rental will be considered complete and valid until a signed rental agreement has been received by both parties! 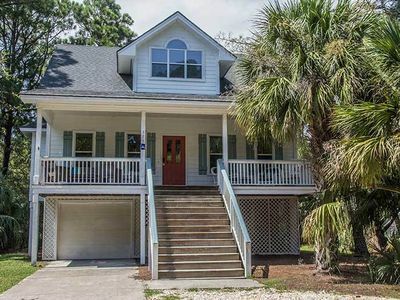 Lowcountry cottage sleeps 6 - close to PARRIS ISLAND, BEAUFORT and BEACHES.